Click the button below to pay a deposit or make and event rental payment. The large banquet hall seats up to 250 or can be divided into three smaller rooms, each seating up to 50 or 60. Sound system and video projector available. Color peaks in July in our beautiful Peace Garden with gazebo and water feature. Recommended for June through September. ​Spacious Living Room, Dining Room, Library, and Atrium can accommodate your group for sit down or open house style event in a beautiful historic environment. Hormel Historic Home and Non-Profit 501(c)(3) organizations. Whatever your needs, we will work with you to ensure the best event possible. For specific room dimensions click here. 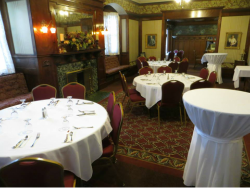 Hosting an event at the Hormel Historic Home offers you flexibility, charm, and convenience and promises you a successful happening! Our wide variety of approved caterers will create the right menu for your successful event. Check out the list of 2018 approved caterers. The Hormel Historic Home has an on-sale liquor license so we can accommodate all your social needs.